An article by J Pierce on the history of the Mexican IWW. The history we tell ourselves about the Mexican IWW is quite brief. Two events are most often repeated that carry the IWW banner: the Insurrectos that invaded Baja, Calif., and proclaimed the Tijuana Commune in 1911, which included amongst them Joe Hill; and the “Tampico General Strike,” of which most of us know very little. Additionally, we hold up Ricardo Flores Magon, his brother Enrique and the Partido Liberal Mexicana (PLM) as somewhat of a stand-in for the Mexican IWW. “Well, the IWW and the PLM had many dual members and they were anarchists so they were like the IWW in Mexico, basically,” we say to those who inquire. However, it was only while I was reading Norman Caulfield’s book, “Mexican Workers and the State: From the Porfiriato to NAFTA,” did this general sketch of the Mexican IWW come into full view as wholly inadequate. This book has been sold by the IWW’s Literature Department for nigh on 10 years, yet I suspect that many of us have never read it. “Mexican Workers” is a treasure trove of research into the extensive IWW organizing and fighting all over Mexico and the borderlands from the 1900s to the 1920s. It is true that the IWW in Mexico and the American Southwest was intimately linked with our allies, the PLM and the Casa del Obrero Munidal (COM), as well as with the Confederación General del Trabajo (CGT) and the communists at times. However, it is not necessary to conflate these organizations; Los Trabajadores Industriales del Mundo (the Spanish translation of “Industrial Workers of the World”) has its own wealth of history in Mexico. In particular, I would like to highlight the names of individual Mexican Wobblies so that we can research them and induct them into our IWW hall of fame, so to speak. There existed a bonafide IWW in Mexico and a constant flow of Mexican IWWs to and from the United States. These workers created fearless newspapers such as: La Unión Industrial, produced in Phoenix starting in 1909; Huelga General, out of Los Angeles in 1913-1914; Solidaridad and Nueva Solidaridad, from Chicago; and El Obrero Industrial, produced in Mexico City in 1919. These publications made their way all over Mexico. Caulfield’s research found mention of these IWW newspapers in complaints of government agents and company managers to their superiors in the United States. These IWW newspapers showed up in rebellious districts in Guanajuato, Hidalgo, Coahuila, Chihuahua and Sonora. Oil and marine transport workers in Tampico were constantly engaged in struggle under the banner of the IWW throughout the 1910s and early 1920s. Most likely, the IWW idea was brought to the Tampico area by sailors from the Marine Transport Workers’ Industrial Union (IU). FWs Pedro Coria (from Arizona), Ramón Parreno, Francisco Gamallo, Rafael Zamudio, Victor Martinez and Jose Zapata are all names that emerged from the constant strikes and agitation in Tampico. In April 1916, mass protests erupted to improve working and living conditions led by the IWW and COM members. These demonstrations turned into a strike that shut down most of the oil companies and public facilities in the area. A year later, in April 1917, another IWW-led strike broke out against El Aguila, an oil company. In the ensuing months, the El Aguila strike spread to at least six other petroleum companies as well as to longshore workers and boatmen, resulting in a general strike of 15,000 workers and halting all oil production. The strike was violently repressed but another large strike in November 1917 was launched after the workers regrouped. In July 1920, the IWW along with the COM fomented yet another general strike of 10,000 oil workers. FW Ramon Cornejo organized textile workers in Villa de Santiago, Monterrey. 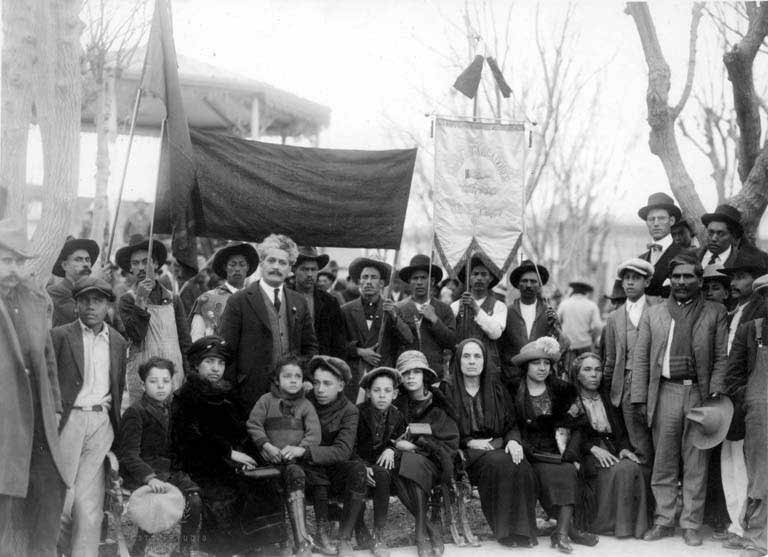 Andres de León was one IWW leader active in Torreón, Coahuila, where the IWW is reported to have had five branches of metal workers in 1912. One name to emerge from the strikes in Cananea, Sonora, was IWW organizer Antonio C. Ramirez who helped lead the three-week strike of October 1920 against the Cananea Consolidated Copper Company. With their headquarters established in Mexico City in 1919, Jose Refugio Rodriguez and Wenceslao Espinoza were two of the Mexico City IWWs who published El Obrero Industrial and attempted to establish a national presence for the IWW. Other names associated with the IWW in Mexico, perhaps in Mexico City, included Walter Fortmeyer and A. Sortmary, who were both deported as the Mexican government tried to crack down on foreign agitators, and Benito Pavon, Edmundo Ibarra and Pablo Ollo. Five thousand smelter workers struck at Santa Eulalia in Chihuahua in 1924. Three of the IWW strike leaders there were Francisco Morales, Enrique Castillo and Francisco Nuñez. At Los Lamentos, Marcos Martinez, Jesus Gonzalez, Basilio Pedroza and Pascual Diaz, who was the branch secretary for Metal Mine Workers IU 210, were all thrust into leadership during strike waves there. During strikes in Santa Barbara, Chihuahua, FWs Eduardo Modesto Flores, Alfredo Lugo and Albert Fodor were all active organizers. Many of the radical miners in Chihuahua were those who had worked higher-paying jobs in Arizona and had joined the IWW there. The mining bosses complained that “Arizona Mexicans” were “overrunning” the mining districts of Chihuahua, spreading their radical ideas of higher wages, expropriation of foreign companies, and workers’ self-management. As the Western Federation of Miners drifted to the right politically (as did its successor, the International Union of Mine, Mill, and Smelter Workers), Mexican American miners in Arizona’s copper mines were leaving these unions and joining the IWW’s Metal Mine Workers’ IU, at that time called Local No. 800. By 1917, the IWW claimed a membership of 5,000 Mexican American miners. Mexican American miners helped established IWW branches in Bisbee, Jerome and Ajo. Mexicans were the core leadership of the IWW miners in Globe-Miami, which claimed 700 dues-paying members including Italians, Finns, Poles and Anglos and would gather on “Wobbly Hill” during strikes and demonstrations. Phoenix Local No. 272 produced leaders such as Guillermo Velarde, Javier Buitimea, Jacinto Barrera and branch secretary Rosendo A. Dorame. In the mining towns, Wobblies Julio Blanco and José Rodríguez were active in Globe-Miami, and Abelardo Ordoñez was active in Morenci. FW Fernando Palomares, a Mayo Indian and a Magonista, participated in both the El Paso smelter strike as well as the Bisbee copper strike of 1917 that lead to the infamous Bisbee Deportation. Los Angeles Local No. 602 has an extensive Mexican IWW history, rich enough to warrant further articles. This branch was a swarming beehive of revolutionary activity surrounding Mexico and the borderlands. It was in Los Angeles where PLMistas and IWWs prepared for the invasion of Baja, Calif., and printed a wealth of agitational material that helped spur the Mexican Revolution. In addition to Huelga General, workers relied upon FW Aurelio Azuara’s unofficial paper, El Rebelde , to bring them IWW news coverage. Other IWW organizers associated with the Los Angeles branch include Primo Tapia de la Cruz, Julio Castillo, Tomás Martínez, B. Negreira, Feliz Cedeño, Manuel Rey and Liunitas Gutiérrez. The goal of this article is to highlight the names of individual Wobblies who organized and fought on both sides of the border and to help bring this history into our contemporary recollection. Further articles and research will help us incorporate these Wobblies and their rich history into our work. For starters, let’s remember one Wobbly who we lost too early: FW Marcos Martinez, an IWW organizer, killed by police as they shot into an open air meeting of striking copper miners on June 30, 1924, in Los Lamentos, Chihuahua, Mexico. This is great, thanks man! Although the COM had numerous anarchist organizers & activists in it, this was not true of all the leading members & the union split, with Luis Morones entering into an alliance of the new CROM with the AFL & Morones worked as an agent of the nationalist generals in the labor movement, and the CGT formed by the libertarian socialists from COM. By early '20s CGT had 50,000 members...surely far larger than IWW in Mexico. this was roughly the same as the IWW's peak membership in USA in 1923. But I've never heard of CGT organization in Mexico's north, such as the copper mining & smelting industry of Sonora. Tampico, on the other hand, was a major CGT stronghold in the '20s. Did IWW activists in Tampico join CGT in the '20s? CGT's big stronghold was Mexico City, especially in the textile & public transit industries.